Lassi is one of the healthiest thirst quenchers in summers. Mint is great for digestion. 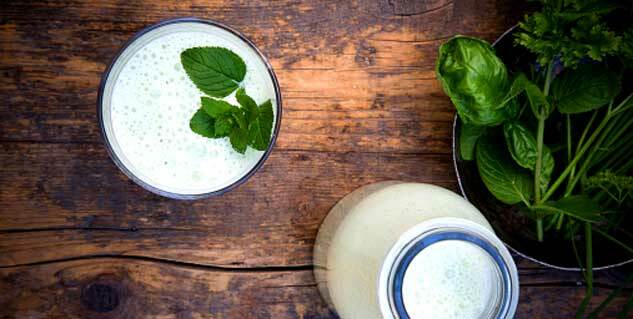 Freshness of mint can enhance the cool element of lassi. It takes just 5 to 7 minutes to prepare Salted Mint Lassi. Summers are beautiful yet very dreaded. Your body runs out of water in summers, the requirement for refreshing drinks increases. Talking about refreshing drinks, what could be more refreshing than traditional lassi fusioned with some refreshing mint? Nothing, we bet. Mint in your lassi will enhance the refreshing element of lassi. This salted mint lassi will not only quench your thirst but will also save you from adverse effects of ruthless summer heat. Mint is good for your digestive system, it’s a great mouth freshener and it instantly cools you down. It will take only 5 minutes or may be less to prepare mint lassi for two people. You’ll require these few items to prepare it. First of all take a grinder and mix mint leaves, curd, ginger curd, salt and black salt in 1 cup of water. Pour the mixture in a glass and add some ice cubes. Now, you can garnish it with mint leaves and cumin powder. The mint lassi is ready to be served.